Your roof is one of the most important parts of your home. It protects your home from Calgary’s hot summers, cold winters and everything in between. If you have missing shingles, leaks or damage to your roof, it’s imperative to find a solution. If your roof is in rough shape, there are two options. You can either re-roofing or replace your roof altogether. A completely new roof generally isn’t the cheapest option, and it isn’t always necessary. Here at Claw Roofing Calgary, we try to recommend fixing your roof before making the investment on an entirely new roof. However, sometimes full replacements are necessary. So, how can you tell if you need an entirely new roof or can just fix your existing one? Here at Claw Roofing Calgary, we’ve compiled a few ways you can determine if you need to replace your existing roof or if it is recoverable. Additionally, take a look at one of our other blog posts if you’d like to learn more about preserving the longevity of your roof. Repairing your current roof is usually a more economical option than replacing the whole thing. In some cases, new shingles can be laid overtop of old ones. This is usually a good solution if your roof is still structurally sound, your roofs sheathing/roof deck doesn’t have problems, but your roof still needs new shingles. The pitch of your roof and how many stories your home has will determine how much a re-roof will cost. If your home is a single story with a low pitched roof, re-roofing will be much easier, and in turn, a more economical option. Additionally, you’ll want to consider what type of shingles are best for your roof. Some shingles are better suited to re-roofing than others. For example, asphalt shingles are easier to re-roof with than metal roofing. 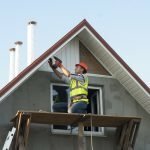 When Is A New Roof Required? A new roof isn’t always the cheapest option, but if it’s required, it’s a necessary expense. Besides, you can’t put a price on keeping your home and family safe. If your home’s roof has been re-roofed in the past and has more than two or three layers of roofing materials on it, it may be necessary to replace your roof. Additionally, if there is water damage or rotting or insects on your roof’s deck or if over a quarter of your home’s shingles are missing or damaged, you may want to replace your roof. If you’d like a free consultation on your roof, feel free to contact us at Claw Roofing! We would love to answer any questions you have and help you find the best solution for your roof. Contact us at Claw Roofing Calgary to discuss your roofing options!